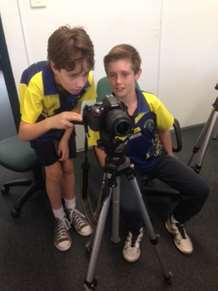 BSPS Student News film crew at work! To be part of the the BSPS News Team Grade 5 and 6 students apply for positions. Each student who applies has a turn throughout the year to be part of the team. Students (and staff) work on producing scripts, learning technical aspects and reporting on the great things that happen within the school.